Building trust between providers and underserved communities is the one of the biggest challenges public health officials face when managing population health. The Meridian Center for Health meets Seattle-area residents where they are—metaphorically and physically. This year's environmentally friendly award winner, designed by architecture and planning firm NBBJ, is adjacent to Mineral Springs Park, a site where Native Americans used red mud for healing purposes, said Brian Uyesugi, lead designer on the project. Now, the LEED Gold-certified building brings a modern interpretation to that history. 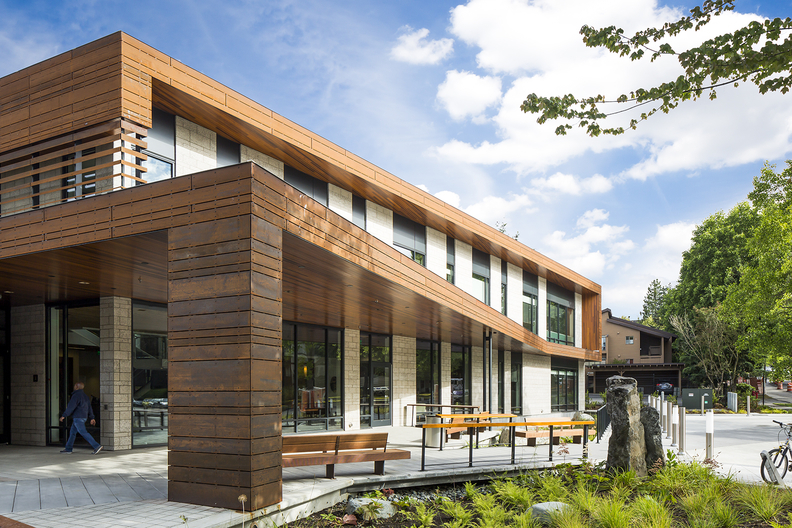 The building's interior and exterior use locally salvaged cedar slabs to seamlessly integrate it into the landscape, while the welcome area features a striking two-story healing wall. The building extends into the park through canopies and overhangs, offering patients who might feel uncomfortable entering the facility another area to receive care. The center's main entry and public waiting areas, where more than 64 languages may be heard on any given day, are designed to be easily accessible. The spaces are flexible and can double as group education and therapy rooms. The integrated health center brings community health provider Neighborcare, gynecological services from Seattle and King County Public Health, and mental health and substance use recovery services from behavior health provider Valley Cities under one energy-efficient roof. Bio-retention cells capture runoff water from the parking lot, roof and driveway. A 25-kilowatt solar array on the roof produces more than 5% of the energy needs for the building, which produces net-zero carbon.